Happy Saturday, Gardeners and Friends of Gardeners! Well, the Monsoon Season is here in the San Joaquin Valley, which generally means humidity, a few clouds and high temperatures, typically without the threat of flooding common in Arizona and Nevada this time of year. Miserable. It's enough to make me think about gardening at night. 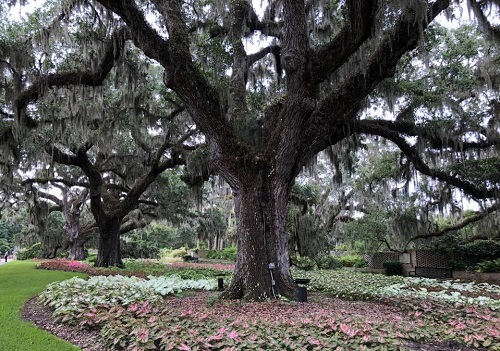 The photo above is from another place where it is hot and humid in summer, Brookgreen Gardens near Myrtle Beach, South Carolina. Looks like a great place to visit. Some impressive, distinctive trees there. 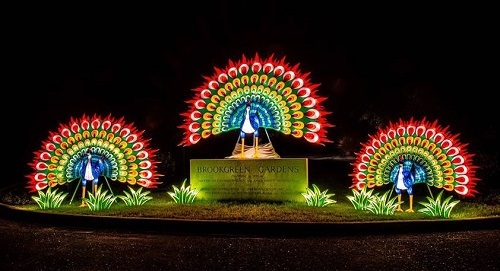 And they're big on Caladiums at Brookgreen. 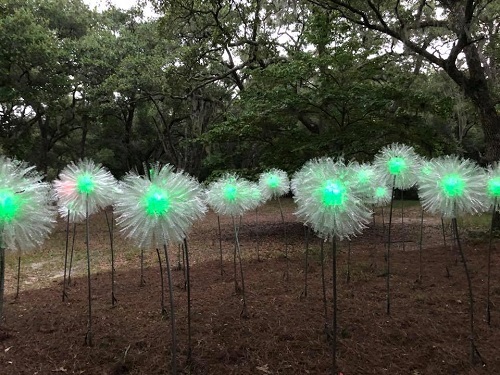 They planted 60,000 of them in the Live Oak Allee in 2013. Don't know how many there are this year. If you want to plant some Caladiums at home next year, remember to wait until the soil is warm. Some cultivars are more sun-tolerant than others. More on this interesting place later. 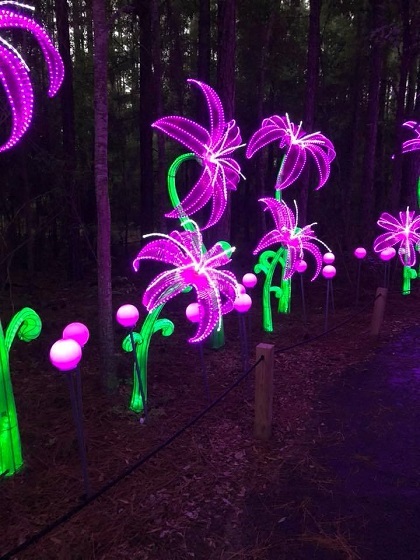 Anybody else visited a botanical garden recently? Besides Don in Kansas? 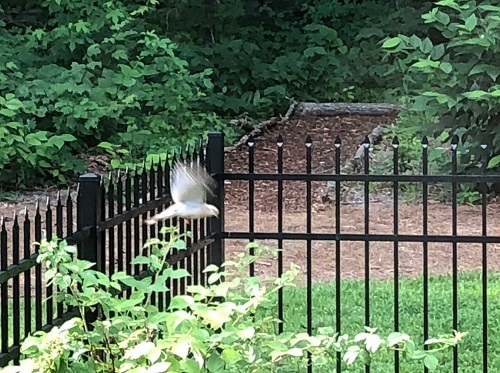 I know it's the gardening thread and not the birdwatching thread, but this happened this week and was pretty cool. We have a hummingbird feeder hanging off our deck and have not had very many hummingbirds this year. About 20 ft away is a windchime with an elephant figurine topper. About five days ago I saw a hummingbird hanging around by the windchime. 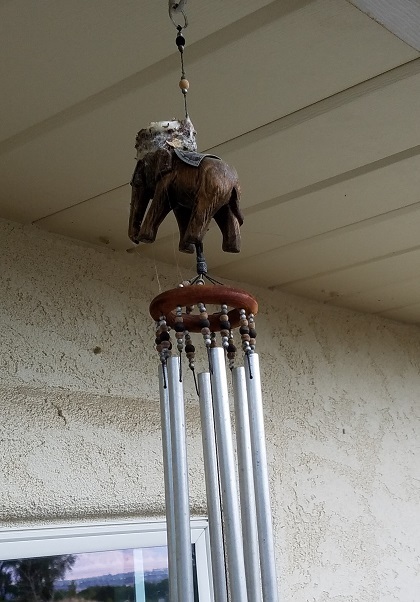 My first thought was that she had mistaken the windchime for the feeder. 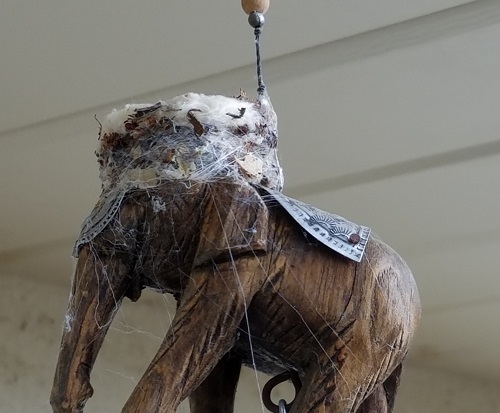 But on closer inspection I noticed that the elephant was wearing a hat. Then two days ago I walked by the windchime and the hummingbird was buzzing all around my head. 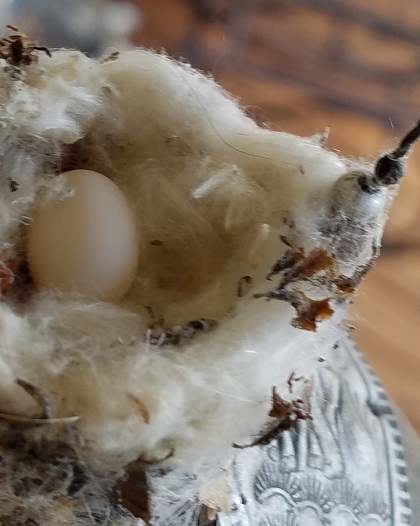 I took another peek and there in the nest was a single egg, about the size of s candied almond or large peanut M&M. We've been watching the momma. She will come and either perch on the edge of the nest, or actually sit down on top for 3-5 minutes at a time, then buzz off, sometimes to the feeder. I've seen a male ruby throated hummingbird nearby so suspect that this is a ruby throated female. It will be fun to watch the next week or so to see if the baby hatches. Please let us know, Muldoon. The hat is more artistic than some modern art I have seen lately. 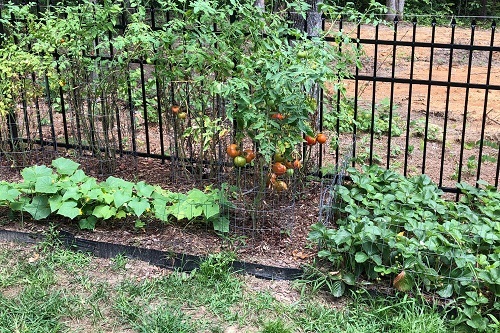 1) TOMATOES: They're ripening and we're enjoying a sliced plateful of them with each meal right now. 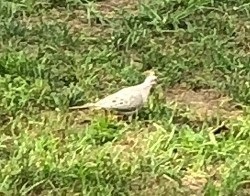 2) ALBINO MOURNING DOVE: I saw this in my backyard yesterday and first thought it must be a non-native exotic dove. You can see the woodland path Cumberland Astro made taking off in the background of that photo. Enticing. 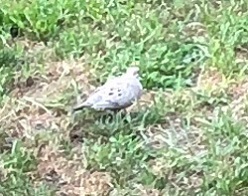 It hung around in my yard for a while and upon closer inspection it looks like it is actually an albino mourning dove. I have another issue which the horde might be interested in. I have two apple trees in my backyard and they are the bane of my existence. I have to rake the apples just so that I can mow the grass underneath. Some years the squirrels take a bit of each apple, then throw the rest down. I got a quote to have them removed and new trees put in their place. I feel like an eco-terrorist, but I just hate them. I like the privacy that they provide though, and it would take a few years for replacement trees to fill in the space. So the big question is if I should remove or not. Let's have a poll! 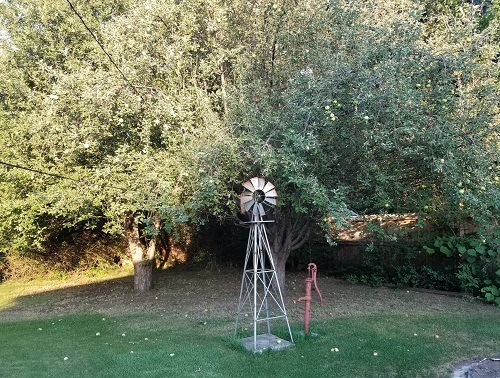 By the way, when I bought the house, my closing docs noted that the windmill and pump were non-functioning and for decoration only. So, a poll? Or does someone have an outside-the-box idea for Denver's apple trees? Hank Curmudgeon sent in some motivational and informative reading on composting. First, composting as a simple summer project and second, what to add to a compost pile. Bugs are A-OK. Animals...not so much. Usually, animals will not be attracted to a compost pile unless there's something in there that there probably shouldn't be. Dairy products, like milk, eggs or cheese are fine in limited quantities, but if used in excess, will cause your compost to smell, which does tend to attract more bugs and animals. 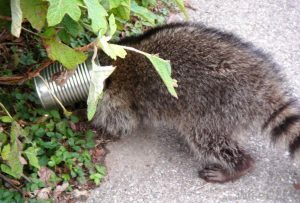 Meat products, while they will decompose and add some beneficial nutrients to soil, will attract raccoons and skunks, as well as other undesirable animals. That's never a good idea. At least it wasn't a bear. Actually, I think there might be a few bugs I would rather skip in compost, too. Weasel sent in a photo of WeaselDog on guard duty. 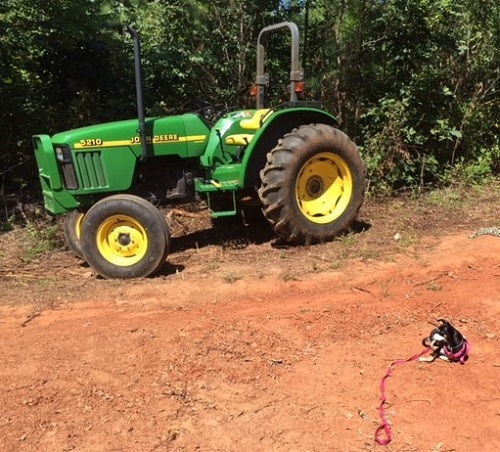 It says something when you need a guard for your "riding lawnmower". But WeaselDog looks like he is doing a great job. I was given these three years ago; planted them in my garden and was happy when they came back the next year. Put out five buds and I was waiting eagerly for them to open. Came out one morning and found all five neatly bitten off. I live in an urban area but we do have deer wander by, since the plant wasn't damaged it appears a deer had an early morning snack. I finally got my flowers this year! I look forward to your gardening thread each Saturday. 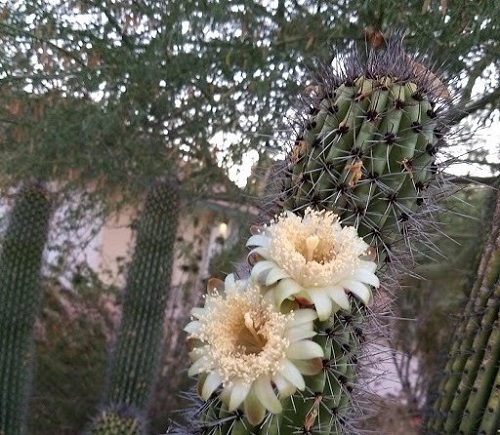 We planted this Organ Pipe Cactus 20 years ago and these are the first blooms we have seen. 1) not supposed to be able to handle the cold we get in Tempe AZ; but this one does fine. 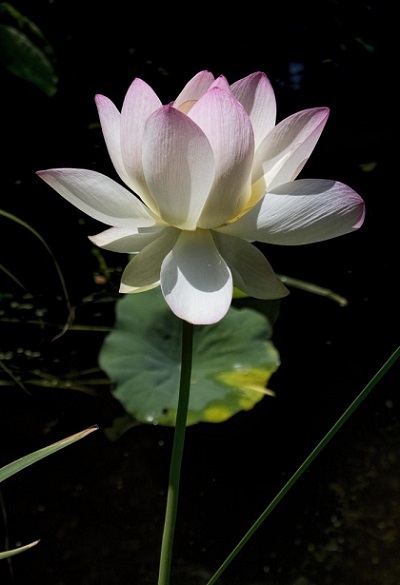 2) only bloom at night because they are pollinated by bats; so you only get to see the open blooms in the early morning. Thanks for thinking of us. Such an interesting flower form, and interesting details on the plant, too.